Greek fire was a substance that, though the name is “Greek Fire” and it was most likely originally developed by the Greeks, it was used mainly by the Byzantium Romans. One of it’s many names was “liquid fire” and was used by spraying out a nozzle onto enemy ships or soldiers. It was especially effective at sea, as the Roman’s navy was generally not as powerful or as skilled as the enemy navies they came across, so the greek fire was a great advantage. When it was sprayed onto an enemy ship, it would ignite as it came out of the Roman nozzle, sticking to the wooden ships of the enemy and the crew manning it while still ignited. 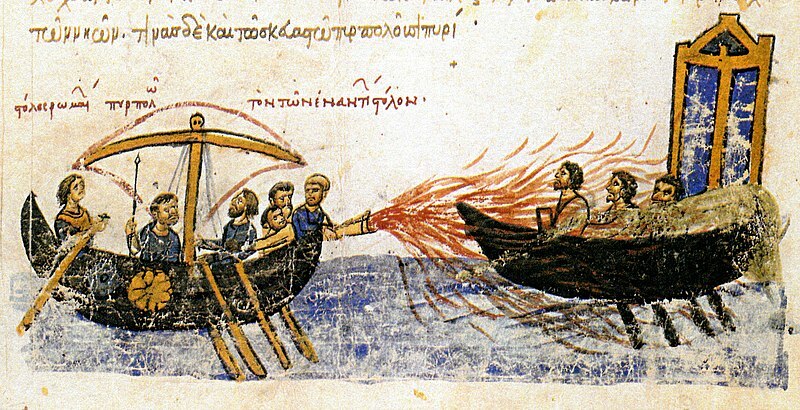 Greek fire burned so fiercly, it would not go out even when submerged underwater, so the victims of this fire were very unfortunate even when they jumped overboard hoping the fire would be extinguished. Not only was it sprayed out at sea, but on land it was put into small clay pots and used as grenades, probably being lighted just before it was tossed into enemy lines. Also large jars of it were used in catapults, possibly bursting into flame because of the friction upon impact. There are still, even today, very many mysteries about greek fire. As you may have noticed, I have used a few words such as “possibly” and “probably”. This is because as we do have tapestries and pot paintings that have pictures of greek fire being used in catapults, grenades, and sprayed through nozzles onto enemy ships, the Byzantiums kept the compostion details and the mechanisms on the ships a very closely guarded secret, so guarded that no recipes have survived today, that we know of. We can take a guess though. Due to the sticking onto things, and to help in the burning, a good deal of Sulfur was probably used, as it melts in the heat of a flame, but is still gooey enough to stick onto things. And people. Also it burned pretty well and, of course, stinks. Meaning the smell (mixed with Hydrogen it becomes a poisonous gas, found in rotten eggs). Some type of gasoline was very probably the primary ingredient, as in burns fiercly and is found plentifully around the black sea in numerous wells. Beyond these ingredients, people are not really sure of the recipe, but maybe it’s a good thing that we don’t know, as some of my younger readers may try it at home. This entry was posted in Uncategorized on December 31, 2012 by Captain Belaq. One of the main reasons the Romans were able to conquer so much is that when they came to a new land, they saw the armour, weapons, and battle strategies used by the people living there, and so the Romans modified their army to have the advantages that their enemy has, resulting in an army that could take on the civilized world. 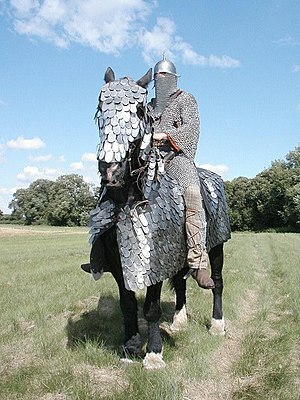 One of the armour variants they copied was a type called “scale armour”. Scale armour was used mostly by the peoples in the east; such as around Canaan and Egypt, as in these areas the nations relied on skirmishing and maneuverability, and so they (and their horses) needed good flexible armour. Anyway, how scale armour was made is actually very simple, and consisted of some sort of cloth material. Whatever any people had most of, like the shepherd warriors would use wool, or the keepers of cattle would use leather, and so on. It would consist of this material and some sort of metal plates. This is how it was made. First, plates shaped like fish scales would be punched out of metal plate, whether it be iron or bronze, and two holes made at he top of each scale. Then the material would be sown into a sort of simple tunic, to which a row of scales is sown at the bottom edge. Now a second row is sown just above and overlapping the first, and a third overlapping the second, and so on until the tunic is covered in overlapping scales, which was flexible and easy to move around in.